(Phys.org)—Quadrotors that can not only successfully fly in the air but can also roll along on the ground represent the kind of exercise that moves researchers at the Robotics Lab at Illinois Institute of Technology (IIT), which is part of the Mechanical, Materials, and Aerospace Engineering Department. Engineers there have developed a vehicle that indeed can move on land and air. The IIT 's research is centered on robotics, working toward a better understanding of how mobile systems may perform in challenging environments, including terrain interactions. Their HyTAQ (Hybrid Terrestrial and Aerial Quadrotor) has four rotors for flying but is also surrounded by a cylindrical cage constructed from polycarbonate and carbon fiber. The crash-proof device acts like a wheel when it's on the ground, as well as a shock absorber, and it can avoid banging into walls. The cage can roll freely; the HyTAQ engineers said that the device works well in indoor and outdoor environments even when wind gusts prohibit successful aerial locomotion. The team highlighted the difference between HyTAQ and aerial-only devices, saying that the HyTAQ is more energy-efficient. During terrestrial locomotion, the robot only needs to overcome rolling resistance and consumes much less energy compared to the aerial mode. Their experiments showed that it can travel four times more and operate almost six times longer than an aerial-only machine. "This solves one of the most vexing problems of quadrotors and rotorcraft in general—their short operation time," they said. HyTAQ moves seamlessly from ground to air and back again "It also solves one of the most challenging problems in terrestrial robot design—obstacle avoidance. When an obstacle is encountered, the system simply flies over it." Another success factor in its design, they said, was indeed the cage. 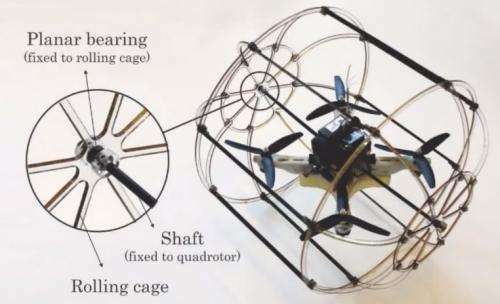 "Adding a rolling cage to the quadrotor makes terrestrial locomotion possible using the same actuator set and control system." Doctoral candidate Arash Kalantari and Prof. Matthew Spenko are the two researchers behind the HyTAQ robot. Earlier this year, Kalantari won the June 2012 Innovation award from the Boca Bearing Company's Innovation Contest. The award-winning device had features that indicate Kalantari and Spenko would go in this HyTAQ direction. Kalantari's Walking Quadrotor Aerial Vehicle was the showcased winner, described as a hybrid robot capable of both aerial and terrestrial locomotion. "A unique compliant mechanism design makes it possible to use a single actuator set for both walking and flying. This is advantageous because it reduces both the total weight of the system and the control system complexity," he said. Four brushless DC motors provided the required thrust for flying. He said his goal in building the walking quadrotor aerial device lay in his effort "to increase the functionality of a well-known flying mechanism (quadrotor) without adding any primary actuator to the system and by just using the same system actuators." That's some great engineering work! Think of realistic uses for this. I figure land/ice surveys in the Arctic and Antarctic. Wonderful work of imagination! Now, couldn't this concept be somehow scaled up into a human-carrying vehicle, such as a personal flying car for everyday use? It would certainly reduce the need for so many highways and roads. Why a robot? A ballast tail should suffice. Make ballast the battery. That would obstruct the roll cage, but would prove the computer redundant and a useless weight. I doubt this unit has a price below the $100 needed for off-the-shelf radio control parts.